It was the second day of construction. We were supposed to be building, but the supplies still hadn’t arrived. We were hanging out near the half constructed bodega that we were working on and started noticing the clay. Natural inclination is to make little balls of clay. My soon to be sculpting collaborator Saelee mentioned Hikaru Dorodango, the Japanese art of polishing balls of mud until they are shiny. Tried that, and it did not really work out. Plus, I think you have to do it for a long time. The mud balls – er clay – turned into an attempt to make a basketball out of clay for a quick game. Also was not successful, but that basketball became the base for our “snowman”, which grew more elaborate as Steve – another esteemed colleague – began to gather small bits from around the construction site: roasted corn husks, flower petals, coffee beans, sticks, wood shavings. Really much of the natural detritus of the village. It started to form. Eyes, ears, mouth, hair, lips, eyebrows, nose and arms. Then some clothes. As we worked on this figure, more and more people from the town coming to watch. Absorbed, we did not notice that we had a huge audience until we were almost finished and at one point I remember Saelee asking, “there are a lot of people watching, aren’t there?”. I don’t really know if the people were thinking that we were just crazy gringos or some wayward santeros. Probably the former, right? 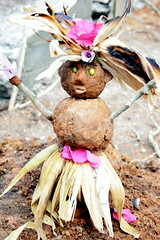 The end result is what you see in the accompanying picture: a fully formed clay woman.